Lifeline was a medical interview program made by the BBC and produced by Hugh Burnett during 1957 to 1959. In “Mars and Venus speak to Earth” the interviewer has George King, a taxi driver who founded the Aetherius Society describe being contacted by “The Space people”, plays a recording of his mothers description of a “flying saucer” and demonstrate a “trance” in which Mr King in a monotone voice contacts a space person “Aetherius from Venus” to deliver a message, which may have been a part of George King's motivation in appearing on the show. The programme then has an Astronomer “Dewhirst” present his perspective on the abnormal account and then a Jungian psychiatrist interprete symbolically the significance of Mr Kings abnormal account. The program functions as part of a dominant discourse of Science that phenomena can be investigated rationally and explained using Science. There are a number of power relationships evident in the medical interview program, Mr King is exposed to public scrutiny and compelled to provide evidence for his world view while the psychiatrists remain anonymous due to category entitlements of their profession and subject his account to the Scientific Discourse of Astronomy and Psychiatry circa 1959. He is treated as an object of enquiry, made very much part of an outgroup, with the dominant ingroup being the scientists. Part of this scientific discourse is the value of impartiality, thus Mr King is invited to provide a trance, which I would argue is form of display in the spiritualist tradition, he speaks in a monotone, the intonation is supposed to convey otherwordliness and tries to evoke the transmitted entity as being superior and benevolvent, Aetherius refers to the interviewer as “my friend”. 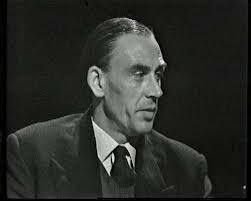 The interviewer questions Mr King as the transmitted intelligence Aetherius, asks him “ Where are you speaking from now?” around 17 minutes, 47 seconds into the program (I, 17:47), Mr Kings reply as Aetherius is “I am sorry my dear friend, I cannot answer that question for you”. Mr King is invoking a resistance discourse, the Scientific fallibility discourse, that Science does not know everything and thus there are limits to the human ability to account for abnormal experience. This counter discourse is apparent in Mr Kings attempt to account for the construction of “flying saucers” indicating that they are made of an “organic metal” around 7 minutes 22 seconds and that it has a “living cellular structure”. The topic flow of the interview is controlled by the interviewer, with the interviewer making interrogations, repeating the points he wants to make . Cohesion is maintained in Mr Kings account by anaphoric reference using “it's” and “it is” which occurs in many of the utterances of the scientists. When the interviewer invites Dewhirst the Astronomer to “deal” with Mr Kings account of the construction of a flying saucer Dewhirst indicates “Mr King and I are not speaking the same language” around 23 minutes in the program and indicates the lexical item “organic metals” is completely meaningless. Thus Mr King is clearly speaking a inferior language variety in the context of the program. Part of the problem is that Mr King is trying to use the Dominant Scientific discourse to provide validity to his account against ingroup Scientists. They function as gatekeepers in this program for what constitutes scientific truth. Mr King in using the lexical item “organic metals” is using two mutually exclusive concepts in a dialectical way to indicate the material is a synthesis of these two mutually exclusive concepts. Mr Dewhirst the Astronomer, a member of the dominant ingroup of scientists refuses to acknowledge it as a lexical item. Both the scientists and Mr King are trying to evoke truth values consistent with the Dominant Scientific discourse, the value of empirical observation but Mr Kings evidence is based on flawed testimony and cannot be falsified as it has a heavy religious component thus the scientists describe him as “sincere but deluded” and thus provide an account for Mr Kings actions, that is representative social issues of the time. The interviewer and other scientists speak a formal scienfic Oxford English register and use forms of politeness and titles when referring to each other. Politeness and impartiality aside I am inclined to wonder how nice it is to be subjected to investigation and described as “sincere but deluded”. Mr King had an agenda and the scientists referred to him as Chairman of the Aetherius Society. Thus there must have been reasons for Mr King to maintain involvement with this program, possibly psychological and esteem based. He eventually became a cult leader and the Aetherius Society is an established UFO religion. The 1959 TV broad cast is also referenced in a documentary "TV's Believe it or not", describing the development of TV broadcasts over time. The interview is described as an example of the bizarre content of early TV programs. .